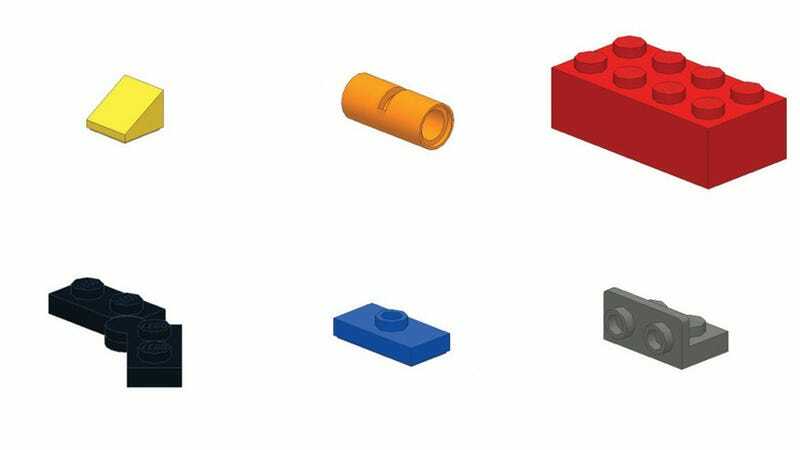 These are the exciting bricks that open up whole new possibilities in LEGO building. In my experience, the most useful bricks are those that change the direction of the studs or give fine detailing to models. It seems like no matter how many of these bricks I have, they’re never enough. Warren Elsmore has been in love with LEGO since the age of four. These days, he's seen as a LEGO artist, and is commissioned to construct huge models out of the plastic bricks—from Olympic stadia to international train stations. In this excerpt from his new book, Brick City, he lists the ten LEGO pieces he finds most useful. These are the little brothers of the hinge bricks that I remember as a child – small but strong hinges that let you choose the exact angle for your creation. When one stud is just too much! Jumpers are excellent for creating half-stud offset for fine details. Check out the 2x2 Jumper, too. (Officially called an ‘Earling’ after the brick’s inventor) The original ‘Studs Not On Top’ (SNOT) brick, used for headlights on millions of cars. Its geometry is very clever – the depth of the recess is exactly the height of two plates. Nicknamed the ‘dalek’ in the UK, these are fantastic for creating small columns, as they let you point plates out in four directions. Overlap them and you have eight directions. Nicknamed a ‘ross’, as it is half a ‘davros’ – which, as you will know if you watch Doctor Who, might be described as a half dalek! These bricks give you a simple way of attaching a plate to the side of a brick – for detailing or to use a special brick in an unexpected manner. A new piece introduced in 2012, but so useful! These pieces help where other brackets can’t, and add real strength to your model. Only available in the LEGO® game sets, these parts are suitable for anchoring rods into the floor. A great piece that gives models a really smooth, modern look. These are useful for modelling buildings, vehicles, and even animals. The oldest brick around, and still my personal favourite. Strong, compact, and great for providing structure underneath something delicate. In his new book, Brick City, LEGO artist Warren Elsmore takes readers on a world tour and explores more than 12 global cities and their iconic structures. Each city is examined and recreated in LEGO form. Comprising amazing artwork, exploratory photographs and detailed breakdowns, Brick City looks at the essence of what makes an urban landscape recognizable.